Bryant, Giles and John Gallienne. "Anglican Church Music". The Canadian Encyclopedia, 20 January 2014, Historica Canada. https://www.thecanadianencyclopedia.ca/en/article/anglican-church-music-emc. Accessed 21 April 2019. Anglican church music. Music employed in the rituals and services of the Anglican Church of Canada, known until 1955 as the Church of England in Canada. There were some 2.4 million Anglicans in Canada in 1981. Music employed in the rituals and services of the Anglican Church of Canada, known until 1955 as the Church of England in Canada. There were some 2.4 million Anglicans in Canada in 1981. The Church of England was among the first churches to establish a presence in Canada. The first service was held in October 1710, at the French chapel in Port Royal, NS, after the capture of that settlement by the English, who renamed it Annapolis Royal and made it the seat of the Nova Scotia government 1710-49. The Cathedral Parish of St. John the Baptist in St. John's, Nfld dates from 1699, but the first Church of England church built in Canada (and in fact the first non-Roman Catholic church) was St Paul's, Halifax, erected in 1750. It introduced a choir during the early 1760s and an organ, possibly of Spanish origin, in 1765. Early organists at St Paul's were a Mr Evans 1765-6, Richard Bulkeley 1767-8, and Viere Warner 1768-ca 1770. Conflict arose in July 1770 when Warner was censured by the vestry of St Paul's for displaying "a light mind in the Several tunes he plays, called Voluntaries, to the great Offence of the Congregation." At the same time the church's choir was accused of singing anthems whose words and music were not understood by the congregation. (For the full text of this remonstrance see Kallmann History of Music in Canada, p 41.) Despite the criticism of Warner's elaboration of church music, it is noteworthy that in 1769, while he was still at St Paul's, an oratorio was performed there by the Philharmonic Society and officers of the army and navy; and in 1789, at a service celebrating George III's recovery from 'insanity' (now thought to have been a breakdown caused by an inherited metabolic defect), the final chorus of Messiah and a coronation anthem by Handel were performed at the church. The first surpliced choir in Canada is said to have sung (under John Bentley) at the consecration of the Cathedral of the Holy Trinity in Quebec City in 1804. In 1819 a choir was established in Toronto at St James' Cathedral, but that city's first surpliced choir - at Holy Trinity Church - was not formed until 1868. Before the middle of the 19th century most services were accompanied by such instruments as were available, eg, string bass, bassoon, clarinet, and horns. 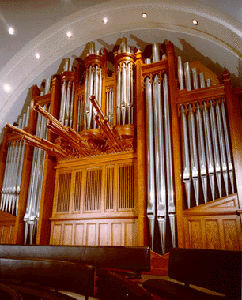 However, in 1801 the Cathedral of the Holy Trinity in Quebec City ordered an organ from England; in 1802 Trinity Church in Saint John, NB, imported one; and in 1818, ca 1833, 1839, and ca 1843, in turn, St George's Cathedral (Kingston, Ont), St James' Cathedral (Toronto), Christ Church (Ottawa), and Christ Church Cathedral (Hamilton) acquired organs. The Roman Catholic church and the Church of England were the first in Canada to employ trained musicians. Stephen Codman, in 1816, succeeded John Bentley as organist-choirmaster at the Cathedral of the Holy Trinity in Quebec City. Edward Hodges, an organist with a D MUS from Cambridge, served briefly in 1838 at St James' Cathedral in Toronto. J.P. Clarke was organist 1844-5 at Christ Church Cathedral, Hamilton, and 1848-9 at St James' in Toronto; and John Carter served 1854-6 at Holy Trinity, Quebec City, and 1856-78 at St James', Toronto. Bishops who greatly encouraged the development of church music during the 19th century were Jacob Mountain (1749-1825) of Quebec, John Medley (1804-92) of Fredericton, and Bishop Acton Windeyer Sillitoe (1841-94) of New Westminster. Publications of the time give an idea of what was sung in the Church of England in the 19th century. A Selection of Psalms and Hymns (Toronto 1834 without music, 1835 with music; compiled by William Warren, first organist at St James' Cathedral, Toronto) offered metrical psalms, hymn-tunes, and chants for the canticles. A later edition (1842) added words for anthems by composers such as Arnold, Attwood, Boyce, Callcott, T. Clarke, Handel, and Kent and adaptations of music by Haydn, Mozart, and Pergolesi. A sixth edition appeared in 1857, proving the popularity of this collection. Canadian Church Psalmody (Toronto 1845, compiled by J.P. Clarke) added to the repertoire a greater selection of chants, some Gregorian melodies, and two Te Deums and seven other pieces by the compiler. A Church Hymn Book (Toronto 1862) offered 254 hymns. The largest Anglican hymnal with music published prior to 1900 was the Church Hymnal (Montreal 1886); it contains over 500 tunes..
On the basis of these publications and other oblique references, one may attempt a general chronology of the growth of service music. Until 1835, the standard fare was Tate and Brady or similar metrical psalms. After 1836 there was a gradual growth in the use of general hymns and in the chanting of the canticles and later the psalms, in non-metrical forms. The 1857 appointment of W.S. Vail to Holy Trinity Church, Toronto, contributed to a wider use of Gregorian chants and melodies. Vail was a pupil of Thomas Helmore (an English champion of plainsong), and under his direction the choral service was sung in its entirety for the first time in Toronto in 1869. During the latter half of the 19th century the musical practices in the Church of England in Canada paralleled those in the mother church in England, though they were tempered always by the essentially pioneer character of Canadian life, with sharp differences between urban and rural areas. In the urban churches larger organs were installed, choirs were expanded in size, and paid solo quartets appeared. The works of Joseph Barnby, John Dykes, Gounod, Mendelssohn, Spohr, and Stainer and the anthems of John Henry Maunder and Caleb Simper were played and sung regularly. The custom of seasonal church performances of oratorios and other major choral works grew and has continued to this day. In large cities the repertoire began to imitate the English cathedral tradition. In the early decades of the 20th century, mainly owing to the practical scholarly efforts of Richard Terry and Edmund Fellowes, the cathedral tradition started to regain its long-lost vigour in England, restoring to the repertoire in some quantity the music of the Tudor polyphonists (Taverner, Tallis, Byrd, Tye, Morley, Mundy, Farrant, Gibbons, and others) and such restoration composers as Purcell, Croft, Greene, and Boyce. The church in Canada followed suit, if at a slight distance. Symptomatic of this revival was the growth of interest in the forgotten art of unaccompanied choral singing - A.S. Vogt's choirs were pioneers in the 1890s. There also was an interest in music by early 20th-century traditionalists such as Parry, Stanford, and Charles Wood. In this period one can see the beginnings of a reaction against what has been called 'the sensational, sentimental and meretricious'. Parry's "I Was Glad" was sung in Christ Church Cathedral, Fredericton, in 1913, though in company with works by Smart and Eyre. The Book of Common Praise (Toronto 1908) was widely used in Anglican churches. An increase in the number of male choirs was another direct result of the influence of English cathedral tradition. Two such choirs which enjoyed considerable success were those of the Church of St Simon-the-Apostle, Toronto, led by Eric Lewis, and St George's Cathedral, Kingston, Ont, led by George Maybee; St George's sang at Westminster Abbey services in 1954 and 1965. Other outstanding Anglican church musicians of the 20th century include Gerald Bales, Hugh Bancroft, Vernon Barford, Edward Arthur Bishop (Cathedral of the Holy Trinity, Quebec City), Giles Bryant, Frederick Chubb, Stephen Crisp, Frederick Egener, Arthur Egerton, Maitland Farmer, John Gallienne, Fred Geoghegan, Donald Hadfield, Albert Ham, Ned Hanson, Godfrey Hewitt, Derek Holman, Norman Hurrle, Frances Macdonnell, Donald Mackey, Kenneth Meek, Charles Peaker, John Tuttle, Patrick Wedd, Gerald Wheeler, Alfred Whitehead, and Leonard Wilson. The work of Healey Willan, who came to Canada in 1913, led to a greater appreciation of Gregorian music and renaissance polyphony, and to a further rejection of sentimentality and display in church music. This is evident in "high" (ie, "Anglo-Catholic") church services such as those at the Church of St Mary Magdalene in Toronto, for which Willan directed the music for many years, and those at St Barnabas in Victoria, BC, led by Ian Galliford and at St James in Vancouver. The development of Anglican church music in the Prairie provinces was handicapped until 1950 by the scarcity of organs between Winnipeg and Vancouver. Hugh Bancroft maintained a fine choral program in All Saints Cathedral Edmonton, continued by Jeremy Spurgeon, and good choirs flourished also in Calgary, Regina, and Saskatoon, as well as in Winnipeg and Brandon. The Anglican Congress held in Toronto in 1963, with a massed male choir drawn from several cities, demonstrated vividly the growth of church music in Canada. The revised edition of The Book of Common Praise (Toronto 1938), while naturally drawing heavily on earlier hymnals, had provided a further unity for the Canadian church, and its successor, The Hymn Book (Canada 1971), was the product of a rapprochement with the United Church of Canada. A committee has been established to produce a new hymn book in the late 1990s intended, among other things, to contain gender inclusive language throughout. The Parish Psalter has been replaced as the standard book by The Canadian Psalter (both Anglican and plainchant versions, Toronto 1963), based upon the version of the psalms in The Canadian Book of Common Prayer (1959). In the early 1970s many churches began raising funds through sales of recordings made by their choirs and organists, a certain sign of confidence in improved standards. Diocesan choir camps flourished, and the influence of the Royal School of Church Music had grown, particularly through choir festivals. A few churches retained the traditions long established of men's and boys' choirs, and the standard of music in these churches was comparable to that of the leading churches and cathedrals of England. It had long been the custom for English cathedral choirs to make concert tours throughout Canada, but this practice declined as the expense of hosting the choirs, now managed by concert agencies, reached unrealistic proportions. Nevertheless choirs from Canadian churches have continued on occasion to travel, primarily to England: the choir of St George's Cathedral, Kingston, Ont, made its third trip there in 1979; the choir of St. Paul's Cathedral, Regina visited there in 1990; and the choir of the Cathedral Church of the Redeemer, Calgary went there in 1991. The influx of British-trained musicians stopped in the latter 1970s, when as a result of the tightening of immigration laws positions had to be offered to Canadians first. An additional problem in Quebec was the substantial decrease in the anglophone population after 1976, which made it increasingly difficult for Anglican churches to maintain their choirs. Across Canada British-trained musicians have joined US and a growing number of Canadian-born organists and choirmasters to bring a cosmopolitan breadth to the repertoire of major churches today. English cathedral music is supplemented by Palestrina, Josquin, Schütz, Bach, Handel, Haydn, and Mozart. The anthems and settings of Herbert Howells, Kenneth Leighton, William Mathias, and John Rutter are performed along with those of Alan Hovhaness, Gerald Near, and Leo Sowerby and those of the Canadians Bancroft, Bissell, Fleming, Holman, Naylor, Ridout, Whitehead, and Willan. Cathedrals such as St James' (Toronto), St George's (Kingston, Ont), and Christ Church (Vancouver), have performed Viennese masses on regular Sundays, occasionally with orchestra. A factor which had a most significant impact on Canadian church music in the 1980s, was the introduction of the Book of Alternative Services of the Anglican Church of Canada (Toronto 1985). Although many churches had re-ordered the liturgy of the Book of Common Prayer, the language had remained traditional. However this new book, with the option of contemporary language, has led to an increase in congregational participation and a decrease in choral settings of the Eucharist. In order to use the language of the contemporary rites new music had to be found for the choir's participation. There has been a dearth of Canadian choral settings with the exception of Frances Macdonnell's Madawaska Mass, Richard Dacey's Priory Service, Patrick Wedd's Mass of the Crown of Life and a few others, but simple congregational settings by John Rutter, Martin How, William Mathias and others have become the norm. Although the national church has not sanctioned any one setting, the writing of simple congregational music for the alternative Eucharist liturgies has been promoted on a local scale through competitions or commmissions. The Diocese of British Columbia sponsored one such competition in 1987 won by Joyce Winnifred Evans (Denver Col), Robert Fleming (posthumously), and Jacobus Kloppers (Edmonton). Choral evensong has almost disappeared, and can only be found in a very few churches, and then often only on one Sunday of the month. These churches sing the office from the Book of Common Prayer, as the language of the new rite would negate the singing of most of the available settings for choir. The singing of the psalms has changed with the Book of Alternative Services and responsorial methods of performance are being introduced which use a cantor for the verses and congregation for refrains. Canadians George Black and John Gallienne have composed versions. By 1991 a number of leading churches across the country were under the musical direction of women, eg, Frances Macdonnell at Christ Church Cathedral (Ottawa), Melva Graham at Grace Church-on-the-Hill (Toronto), and Alison Riseley at Christ Church Cathedral, Fredericton. In 1986 a new girls' choir was formed at St George's Cathedral in Kingston, Ont, one of the first cathedral girls' choirs established in the country. With the decline in numbers of boys' choirs, the introduction of the Book of Alternative Services, tighter immigration restrictions, and the increase of mixed-voice choirs, a uniquely Canadian church music scene is a strong possibility as we approach the 21st century. The RCCO continued to support church music of all denominations, and the Anglican Foundation, a funding arm of the national church, provided scholarships for beginning organists which is encouraging a renewed interest in the instrument. CMH vols 2, 5 and 9 contain many pieces for Anglican services and the introductions to these volumes describe various genres, practices, and practitioners. See also Choir schools, Hymns and hymn tunes, Plainsong, Religions and music. MacMillan, Sir Ernest. "The organ was my first love," CMJ, vol. 3 Spring 1959.